2 Craig Olson Famous Sayings, Quotes and Quotation. 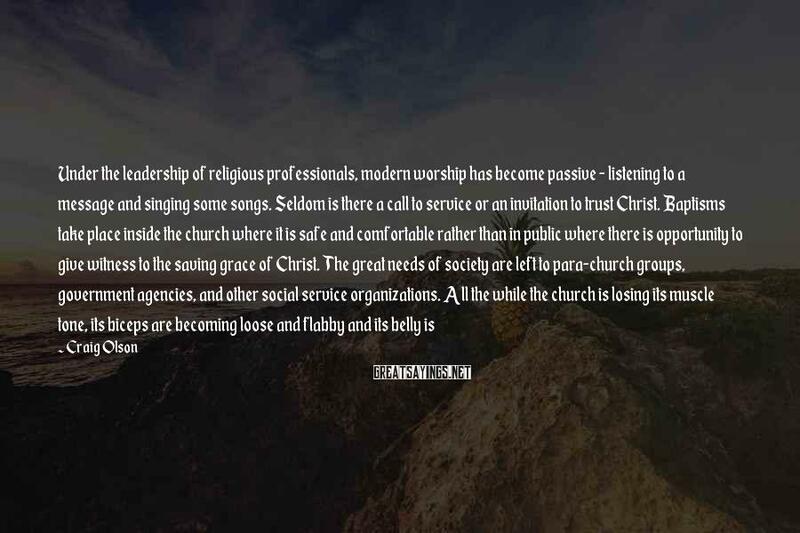 Under the leadership of religious professionals, modern worship has become passive - listening to a message and singing some songs. Seldom is there a call to service or an invitation to trust Christ. Baptisms take place inside the church where it is safe and comfortable rather than in public where there is opportunity to give witness to the saving grace of Christ. The great needs of society are left to para-church groups, government agencies, and other social service organizations. All the while the church is losing its muscle tone, its biceps are becoming loose and flabby and its belly is becoming round and soft. Not a pretty picture for one who once was toned and buff - a lean, mean fighting machine. We take a cavalier approach to Scripture at our own peril. If the scientific and historical accounts are true, then the commandments, promises and penalties are much more so. The Bible is not just a guideline. It is the authoritative Word of God. Disobeying it has consequences. Obeying it has rewards. Yet we fudge. We compromise. We rationalize. 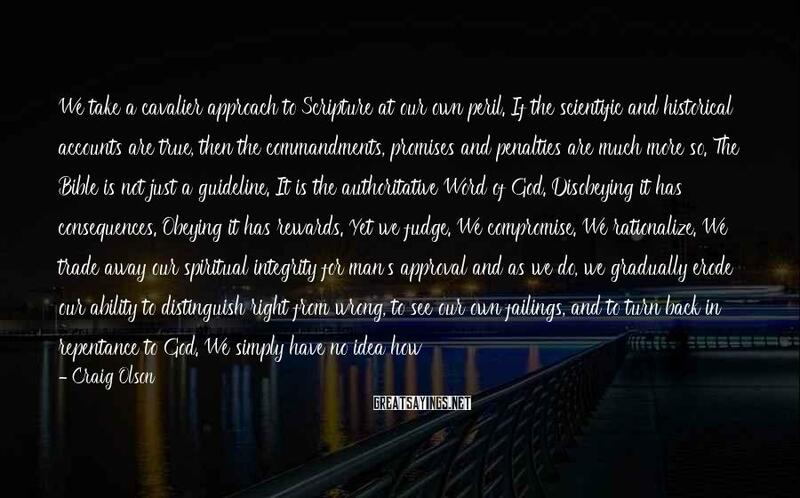 We trade away our spiritual integrity for man's approval and as we do, we gradually erode our ability to distinguish right from wrong, to see our own failings, and to turn back in repentance to God. We simply have no idea how this cavalier attitude towards God's Word taints our witness and hinders the kingdom of God.